Subscribe on iTunes, Spotify, Stitcher, TuneIn – and now Google Podcasts! We’d love to hear your thoughts, comments, and questions! Record a quick free voicemail via speakpipe for inclusion in the next episode. Or you can post your thoughts or follow-on links via twitter @podcastedtech or via The Edtech Podcast Facebook page or Instagram. Don’t be afraid to reach out and talk to us on any of our social media platforms. Tell us why professional development is important to you, students, or how it has impacted you! Join 250 like-minded souls at The Edtech Podcast Festival this Saturday 22nd September at Plexal in the Queen Elizabeth Olympic Park in London. Edtech and Educator Workshops, including Oracy workshops from School21, a LIVE podcast programme with multiple edu podcasters including Teacher Toolkit, pop-up book shop and book signings run by the Wellcome Collection Shop, a Makers Yard with pop-up makerspace from Imperial College London and much much more. Register here. Edutech Africa: Bringing together the entire education sector in Africa to learn, be inspired and exchange ideas.Bringing together the entire education sector in Africa to learn, be inspired and exchange ideas. 9-10 October 2018, Sandton Convention Centre, SA. SOPHIE BAILEY: Hi everyone from a very sunny London. 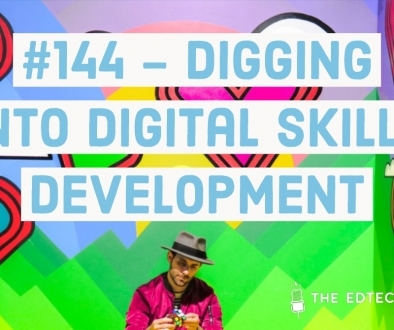 This is the Edtech Podcast, the show to improve the dialogue between Ed and tech for better innovation and impact. And I’m just back from cycling across France where we raised over £12,000 for three chosen charities, so very pleased with that. Of course, instead of sunshine there it was record rainfall and some of the roads we cycled up have had since been washed away which is going to prove a big problem for the Tour de France organizers. 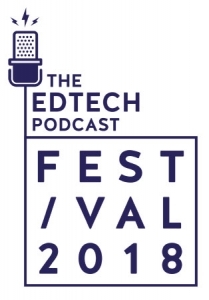 But anyway, I’m straight back into the swing of things here with EdTechX and London Edtech week, and next week I’m also going to be part of the podcasting corner at the London Festival of Learning at UCL, so do come over and say hi if you’re in town. You can charge your phones at the podcasting corner while you also listen to episodes of the Edtech Podcast and the Nevertheless Podcast. What else this week? Well, the Edtech Podcast has joined the very brand new and shiny Google Podcast App for Android, so if you’re a Google lover or you use Google apps, go and check us out there. It has also been a very exciting week for our latest episode which was a special one off with three students: Malika, Edil and Sungna from Six 21, the Six formed in Newham, London who researched, produced and published their podcast as part of their real world learning program. So well done to all three of you and I hope you enjoy if you’ve listened into that episode. I’m hoping very much to see them heading up NPR or radio lab in the feature. So what else can I report back on? Well, the Edtech Podcast Festival, if you haven’t got your ticket yet, latest updates includes: Hundred from Finland will be running a workshop for teachers on innovations through around the world; Hackney Learning Trust will be sharing insights on their school improvement plan strategies; and the co-found of Cahoot, is going to be talking about putting learners at the heart of your Edtech design. This week’s episode however, what have we got in store? 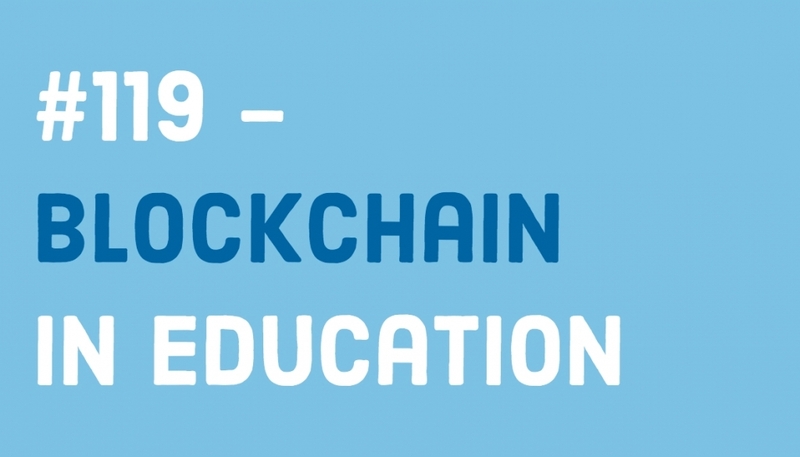 Well, this week’s episode was recorded at the Global Education & Skills World Forum back in the spring, and focuses very much on what Blockchain means for education. So, obviously Blockchain could just be a very ethereal buzzwords and focusing on the crypto currencies part and all of that, but actually we will be looking at what an indelible record could mean for student achievement, CVs, protecting the IP of current education providers, and keeping learner records all together in one place not withstanding some of the complications still with Blockchain, so whether that’s regulatory issues or actually the question of whether the value of those credentials going on the Blockchain is something that we need to look at the further. Anyhow, we are in conversation with Natalie Smolenski, a cultural anthropologist and the Biz Dev lead for Blockcerts. And Blockcerts is an open standard for creating, issuing, viewing, and verifying Blockchain based certificates. It’s initially a collaboration between MIT Media Lab and Learning Machine, very much is looking to engage with other partners in their project. The second guest is Alex Grech, who is Founding Director of the Commonwealth Centre for Connected Learning. He’s also a co-author of a recent study on the Blockchain in Education, which was in collaboration with the European Commission, and he is a keen advocate for the early and open internet. I hope you enjoy this episode. If you do, please feel free to give us a taste of your review on iTunes, Spotify, or Google Podcast now that we’re there, and we would very much love you forever! SOPHIE BAILEY: So, please can you tell me who you are and what you do? ALEX GRECH: Okay, my name is Alex Grech, I’m a strategist and I’m a teach new media and I’m an adviser to the Minister for Education and Employment in Malta and I’m currently coordinating a Nation State Pilots using the Blockcerts for the purpose of universal credentials on the Blockchain. SOPHIE BAILEY: Very, very, interesting. And you are talking here with Blockcerts at the Global Education Skills Forum, so can you tell us a little bit about exactly what you got into in that discussion? SOPHIE BAILEY: But it’s interesting because you were just telling me so you also authored the Blockchain in Education report of the European Commission, is that right? ALEX GRECH: Yes, I did. And I’ll speed up in terms of what to what happened. In – it’s about 2014, I had developed two key pieces of work for my country which is Malta. One is a new life-long learning strategy on the basis that most people, most people your age will not have one carrier but probably have five or ten, and the whole idea about education which is in the hands of hegemonic institutions which have been around for several centuries and still teaching in a way using 20th century models, you know, all of that is rapidly going away. Any, anybody who has young children, I have a child age 15, I know that my son is not going to be in one job for all of his life and will have many different careers and will probably not have a job or want to be a freelancer, anyway. The whole notion of a life-long learning strategy is that whether you’re aged 21 and just coming out with your spanking new degree from some UK university, that’s not going to be good enough to keep you gainfully employed for the rest of your life. Probably by the age of 50s people would have kicked you out, and also there are people aged 50 who have to reinvent themselves like I did, because unlike most other people, I’ve been in my life a chartered accountant. I’ve been a strategist, I’ve been an adviser to a couple of Prime Ministers, I did a PhD late in my life and got me and myself into a new media. I teach and I you know, I changed things, okay. So that’s life-long strategy. On the other side, we were also looking at new types of credentials on the basis that most people are now learning online. And that’s again, you know, knowledge in the classroom has to be reinvented on the basis that knowledge can be found online now. There are various MOOCs and other, you know, the tools line at the week and all these. So I came to the Blockchain on the basis of those two things. Through serendipity and accident I ended up in MIT Media Lab to run about 2016, specking to Philipp Schmidt and Dan Hughes at Learning Machine and they were literally halfway through a project on using the Blockchain as a means of notarizing credentials. So that was how I got into this, that was about 2016. You fast forward to what happened last year, Malta signed an MOU with Learning Machine to become the first nation state to literally start notarizing all education credentials and their widest formats from academic ones to informal learning on the Blockchain. The one important thing to realize is that even though we are in the 21st Century, credentials are not going away. Certificates are not going away. At the same time you have kids like my kid who spend more time looking at the screen than looking at the paper. We’re still serving them with the paper. The Blockchain enables the institution to have a piece of technology which means that it will only have to issue the certificate once, and it’s fullproof and immutable. From that point onwards, the power really shifts on to the learner; the learner suddenly has copies of his or her credentials wherever they might be. A transcript of whatever has been achieved and then it’s the learner who decides who and what to share it with including future employers. So that’s my two years, yeah. SOPHIE BAILEY: This is really, really fascinating and I just mentioned so in the context of at the moment I’m doing an online course, so it’s about online learning. SOPHIE BAILEY: On Blockchain. And my homework this week was to look at a case study of Blockchain in a particular sector such as education and so I completely get the immutable record of achievement. The question I was left with was, is there a bigger problem around the value of these different providers of education now, so lots of people providing different whether it’s credits or micro credentials or degrees. You’ve then got this record of achievement but if we, are we still stuck with the question of what’s the value of each of those different providers? ALEX GRECH: Yeah, that’s a different question, I mean, so is getting a PhD from MIT Media Lab at a par to my son getting an online certificate from Coursera for doing Basic Coding? I guess not. On the other hand, at the moment, for Jacob stage in his life, getting whatever he got from Coursera kept’s him get on to another nudge up life. It depends on who you are and whom you want to communicate that value to. A lot of employers are extremely concerned that graduates are being turned out by the university system whether it’s in the UK, where you and I have to pay quite a bit of money for your education in the States where there it’s a complete bloodbath in terms of people getting there itself into a $150,000 worth of debt. Or the other side is where you have the countries like mine that provide free education, but a lot of people are saying, is that, are those the right kind of skills set that I need when I then go and find a job? And in fact, what you do is, you then speak to employers and say, I’m faced with people who might have a Bachelors and a Master’s degree but they can’t communicate, they can’t think critically, they can’t think out of the box, they can’t operate on their own. So, there’s a lot—first of all, other credentials that people should be accumulating online to prove that or for instance, in a competitive world, which is being into somebody right now who said that, she—the edge that she got was being able to speak languages, different languages and that’s how she left Canada, went somewhere else. I mean, I remember in my younger days when I moved to London in 1985, I matched to wriggle myself into working for multi-national companies simply because I could speak languages, and that was my way of traveling. Now, was being able to speak Italian or French important for me at that stage in my life? Absolutely! For the kind of companies I was going for. So, my view is that, as you go into life, a lot of these informal credentials, even professional ones. You know getting your Google out towards certificates. Getting a certificate on the Cisco training, is that as important as a university degree? I would say at certain—for certain people, in certain context, absolutely if not more. Notarizing those certificates on the Blockchain means that those certificates become yours as the learner and then you can decide which elements of those including the transcripts to share it with. I remember, when I had to do a PhD late in my life, I went to University of Hull, I had to write to the Association of Chartered Accountants, and ask for transcripts of exams I had done 25 years ago. I had to pay a fee for doing that. Which was a pain for me, a pain for the FCCA and certainly of no relevance to what I was doing in my life because I had stopped being an accountant ages ago but simply needed to prove to a university that asked me to join as a PhD student? So, what the Blockchain does, we have to look at it as an enabling technology to enable us to do things better than we’re doing them right now. But credentials are not going away, okay? We’re still in the 21st century; still have to prove to someone that what you’ve earned in your life is of worth to somebody else. But we simply have to move from paper into some other moving medium. SOPHIE BAILEY: And if someone’s listening in and they think actually, yeah, we want to be the second country to go and do that, what lessons have you learned from getting that actually happening in your country, because a lot of that will be auctioning whether it’s within the ministry or whether it’s within the providers? ALEX GRECH: I think we’ll share our slides because I had a slide to which talked about human networks. To get something like this done, you need to activate those human networks as supposed to technology. The technology was pretty much ready and we knew it would work. Try to get people to buy into this idea of credentials are there for life, lifelong learning. Somebody’s got to see something’s in it for them. So in our case, you have to be, have purpose in this. So I had to engage with anybody from Ministers for Education, Ministers of Finance, all the way down to registrars within the universities. All the way down to learners, all the way down to the media. And you have different messages for different people. The one message that which remains there is that key won. People understands credentials, people understands certificates. They equate them to social capital. They equate them to who I am and who I want to be. If you then get across to people that the Blockchain till now has not been hacked, it’s immutable, it’s trustworthy. And that power shifts from the institution onto the learner, then things start to happen. Now, what’s going to happen on the Blockchain which all the other countries jump on the bandwagon? We’re organizing a conference in May as I was telling you, in Malta. And there are nation states that are piloting stuff. The Dutch Government for instance had been looking at things and they’ll be speaking in this conference. I’ve been doing this for a while. The government of the Bahamas for instance is also looking at this right now. There are entire countries like Estonia they closed Blockchains, okay. But I think you’ll see different models evolving as we go along. I don’t think the Blockchain is going to go away. I think a lot of people are equating it at the moment with crypto currencies and get rich quick. I’m more interested in what can you do with this technology which gets away with inter-media race. When the inter-media race roles are redundant. ALEX GRECH: Okay, the way we’ve done it in Malta and it was the only way we really want to do it was Blockcerts, is an open system. It’s an open standards, so it’s there, anybody with a couple of PhDs can go around and look into the Blockcerts code on GitHub and just start building applications on. What essentially is it’s like the same as Linux used to be or you know, what person have to use a more silly analogy I guess. In our case, it’s the government that has decided to go for pilots and the pilots in Malta are very strategic. They’re entering from the institute for Tourism Studies to the National Commission for Further and Higher Education that is looking at reconfirming the credentials of people who arrived in Malta like refugees, or people with incomplete credentials and having re-established that somebody’s a doctor even if they fell off a boat, or, somebody who said, I’ve missed, I’ve learned in several countries but I’ve got this certificate missing. Once the certificate is reissued in Malta, very innate, these new certificates are notarized on the Blockchain so they’re never lost again. But again, who’s paying for it at the moment, is the government of Malta’s Bank for so and so, learners don’t have to pay a dime. All learners have to do at the moment in terms of the issuing institutions, so we have the VET University in the Malta College for Arts, Sciences and Technologies, National Commission for Further and Higher Education. All school kids at the age of 16, they were just the first time that you can leave compulsory education will have their school certificate notarized on the Blockchain. So, we’re going to have to see if this spreads organically, that learners starts seeing value. Until now, it’s been remarkable that kids look at it, I mean, most of the time they’re looking at the screen anyway, and not looking at you in the face. So it’s to be about ease, how quickly can I download this from Google Play or from the iStore or whatever it is. In five minutes, I’ve got my certificates. I can now share it on Facebook. I can share it for my next employer. So the proof of the pudding is going to be in the eating now. Will learners engage quickly enough? Will employers see value in this? Can this become the norm? Will these credentials spread from being just education to becoming health records, birth certificates, death certificates? That’s where we are right now. SOPHIE BAILEY: Or would it be like a national player, because there’s merit in recognition around learning credentials that are domestic as well as international. ALEX GRECH: Yeah, I think we’re in an interesting phase. I mean, you mentioned the report that we wrote to us all this was happening. I was approached by the Joint Research Centre of the European Commission and what was supposed to be, can you do a quick study for us it ended up being about seven and a half months to prepare in a reports that I co-wrote with my colleague Anthony Camilleri who’s based on Ljubljana and what the report recommends is that, there is an opportunity for the European Commission, so in a way, I look at what’s happened with the internet? I happened to be one of these people who has extremely optimistic about the internet when I start dabbling with these many years ago with my, with one of my teachers, Howard Rheingold, who’s one of the fathers of the internet. You’ll find most of us all these are terribly disillusioned with what’s happened with the internet, okay? We now have a closed ego-system which is dominated by the Silicon Four. We don’t need to name them, we all know who they are. There is an opportunity with the Blockchain in terms of disintermediation and in terms of open standards if entities like the European Commission started amplificating putting its money where its mouth is, and supporting open education, open standards and making sure that those supporters then look at some way that somebody who’s done a course, a little bit of course in Malta, then went to Copenhagen, then went to the States, and then had the gap year, that again, say that yes we start to, you know your best and fantastic opportunity. We have something called the ECTS system, European Credit Transfer System in your—so we can kind of relate to beat some pieces of components of education if we wanted to. Notarizing these things on the Blockchain in perpetuity, I still believe will add value to young people like yourself, okay? And people like my son who is 15 and saying, the education I’m being given is not exactly what I want. I might take a gap here out so maybe I should get a job. I think you’ll going to see people rethinking what education is giving them but I don’t think that credentials is ever going to go away. But Europe, the European Commission in particular has an opportunity to write and what went wrong with the internet where it got very much closed system, is to support the whole eco-system around an open Blockchain as opposed to closed – Blockchains and there will be closed Blockchains, okay. Again, we don’t know what the big suppliers are going to be doing. I don’t know what’s going to happen in the next version of Microsoft 11 or whatever it is, okay? And there will be open APIs and the rest of it but, in our case, when we made a decision, I’m not saying me, here I’m talking as somebody who’s involved in policy making in Malta’s education system. For us open standards were absolutely essential because it means that, if learning machines and supplier go out of business in two years time, let’s say, we can get our team from the University of Malta, and there is already a risk to be able to take that cold and keep on developing it. That’s very important where we coming from. We did not want the kind of lock-in, in other words that’s a lot of governments have with specific suppliers. SOPHIE BAILEY: And if universities are listening in, because we have a few listeners from higher education, if they were kind of querying, is it to my advantage or will it disintermediate universities? What’s your kind of—I mean, you must have had plenty of discussions with the universities around the valley, to them as well. ALEX GRECH: I may not have discussions from anybody from MIT Media Lab and when we’re doing our study for the European Commissions, so I spoke to anybody from University of Nicosia all the way to MIT Media Lab and people doing experiments. You’ll find some very interesting experiments happening in Australia for instance, okay, which I always loved the way the Australians think, they think holistically about these things. It depends on the specific university. People like MIT Media Lab have a brand to protect. There are many people who forge MIT Media certificates and say I’ve got PhD. This is one way of getting round out from a trust factor which is why MIT will put some money into projects like this. ALEX GRECH: Absolutely. So, it would be up to the university—it is in a university’s interests also to say. I’m only going to do it once. I’m going to notarized it once and after that, once the recipient has also activated his or her private key, and downloaded the app or whatever is, and there it is, you’ve got your record. It’s up to you, it’s notarized even 10 years time. Somebody, if somebody comes to check on this, they will check with the hash that that was a real certificate. You can also have, by the way, time dependent certificates. So for instance, if I don’t pay my accountancy certificate, even though I wasted my life away spending six years to become a Chartered Accountant, if I don’t pay FCCA My subscription, they’ll strike me off eventually, right? SOPHIE BAILEY: So, you’re using small contracts to this. ALEX GRECH: So, you can actually have—yeah, yeah, you can actually serve smart contracts exactly built into this. I think we’re at the beginning of what is possible and we’re at the moment thinking of something very small which is credentials, Blockchain and rethinking education. Once you start going to smart contracts way and start thinking over the internet of things of things for instance, this whole thing is exponential. Right now, the challenges that most people are thinking it’s crypto currencies and get rich quick. SOPHIE BAILEY: Yes. There’s a kind of perception issue around the word Blockchain. ALEX GRECH: Oh yeah. Yeah. SOPHIE BAILEY: In which it defers to bitcoin when actually the underlying technology is very, very, interesting. ALEX GRECH: Oh, Google band—I mean, band any adverts related to the Blockchain last week, and following what Facebook did the previous week. Absolutely! So even though for instance in our case, I ran a foundation called, the Commonwealth Centre for Connected Learning and we have a conference on Blockchain credentials, if we wanted to spend some money on Facebook ads, the Facebook won’t take our money at the moment. SOPHIE BAILEY: Well, very, very, interesting. Yeah, on smart contracts, what I was thinking is in the UK, you put your student loan and the student loan’s company quite often let you continue to make payments even though you’ve already finished your payments. SOPHIE BAILEY: But with the smart contract, you both know that it’s finished that it’s done and that’s kind of automated. But they could do that anyways, just the systems thinking. ALEX GRECH: I’m thinking of the University of Nicosia for instance that has a Masters In Crypto Currencies, and a lot of—they have a lot of students who come from Africa, who can’t even if they have the money, can’t afford to remit the money in one full-swoop, so what they’re doing is they’re actually paying money on a chunk by chunk basis and they’re using the Blockchain as a way also but of—not just taking the money and they’re being paid sometimes through Bitcoin for some of these courses. ALEX GRECH: Exactly. Yeah, okay. So, what I like about the Blockchain is the enabling technology aspect, okay. Right on the geeky think, what can you do with the Blockchain to address problems that we have, right now? Can we use the Blockchain to work on—to account for the fact that many kids are being served a certain type of education in a classroom which still looks very Victorian and people being served an education through rows? People who are still getting punitive exams as opposed to modular exams – can we put the Blockchain on the base of what it can do to good use and acknowledge the fact that most kids are run back home from school, put their headphones on, and it’s almost like they’re more from a different world. We must opt as educators, keeping on the mantra that everything we just saw on Wikipedia is bad. And you should listen to some educators, who’s probably my age and still serving the same slides that he or she was serving about 20 years ago, okay? The kids don’t lie. We need to give kids what they need now for the jobs that they have, that they need in the future. SOPHIE BAILEY: And what about ICO’s in relation to Blockchain companies that are engaging with education? So for example the case study that I was looking at recently was at an open source university, I don’t know if you’ve heard of them, but I had I sort of wondering whether there would be a jarring between raising money for a Blockchain in education company and then the education sect may not look that favorably on that form of raising money for a company and I’m not sure how much value the tokens would have. ALEX GRECH: I could give you a straight answer, I don’t know actually I wouldn’t even say I don’t know, I’ll sit on defense on this one. I think they are good actors going the ICO route who have the strategy and who’s heart is in the right place; and there are bad actors who are going in I know of extremely good actress that have almost like an Uber platform which is regulated to the “nth” degree to make sure there’s no money laundering going on and I know bad actors, it’s the same as any other business at the end of the day. SOPHIE BAILEY: And so if people who are listening in and they want to read your 171 page reports? ALEX GRECH: Oh, my gosh, yeah. Good luck, yeah. SOPHIE BAILEY: How to do that? ALEX GRECH: I think there are two ways. If you Google I think, Blockchain in education JRC or European commission the reports will pop up. The proof of the pudding is going to be will young people I believe see value in this but also sadly while older people who are now in charge of the institutions also see value in this and to make some investments. SOPHIE BAILEY: What’s very interesting on that one because I just come from the kind of fake parliaments area and they were debating about whether aging demographics are good or bad for education I suppose, and the supposed part of that is if we’re living this hundred year life cycle then as I was saying earlier, by the time you’re 70 you will still need those credentials and you’ll be adding more still, so. ALEX GRECH: I’m 56 years old. I saw my first computer when I was 23 in Charles Treelane and it was – it cost about £3600 sterling, it’s called the IBM portable. People would laugh at it when they see it but that’s the technology we had all the way to mainframe computers and things like that. So, yeah, people are living longer. I have an 88 year old father in law who teaches at the University of the Third age and I know some very stupid 15 olds who we’re born with technology but are not making mindful use of technology. And there’s a myth in the academia which is, anyway, Marc Prensky has a lot to blame for which is the digital natives the digital micros things which I never subscribed to but it resonate initially, because again, you only have to look at it like a baby being dumped you know instead of talking to the child we now give screenings which means we now have generations of people who can’t write properly can’t speak, can’t communicate. I think older people like me now is the really the time to understand that the old business models form education is severely disrupted because of the Coursera’s of this world and the edicts of a good player is like the edicts of these world and for the future learners of this world and they just have to watch their kids. We need to find a good middle ground. At the end of the day, in the same way that when I teach it’s challenging now to teach people who have screens in front of me like shields and I have to find some way of making my teaching on the day resonate with their lives enough to enable them to either close the screen in front of them or else use the screens for them like I do to make them ask questions which are scared of asking, so I used tools like slide dough for instance to get people to ask question during the class. And I can ask questions at the same time if people can respond real time. We have to put technology to good use. It’s the same thing with the Blockchain. You can – you know it’s like having a car. You can have a car together with your girlfriend or your boyfriend and have a great, great night out or you can use this ISUS style and go and knock down a whole bunch of people. SOPHIE BAILEY: It’s a quote in there about technology being neither evil or nor a good force but being neutral. ALEX GRECH: Yeah, I never believed when Google said doing no evil, or anything like that. It’s certainly not, well, it’s not neutral. But it’s we need a mindfulness and I would go back to a lot of this to work that Howard Rheingold did early on with things like smart and net smarts like about five, six years ago. We need media literacy. We need to teach literacy, we don’t teach this well enough in the class or if we teach it we seemed to think it’s just some other subject we have a huge problem in the classroom, in the boardroom, and in the home; and we’re not addressing this. I’m not saying the Blockchain is going to save any of this cause I know that we need to bridge this old world that partly my generation is responsible for, and what our kids need and the screen is not going to go away for the time being, neither is the certificates. SOPHIE BAILEY: Well, thank you so much Alex. It’s been really fascinating. SOPHIE BAILEY: Okay, so after talking to Alex, having that fantastic conversation about Blockchain in education, I’m now here also with Natalie Smolenskii, who’s VP of Biz Dev and also cultural anthropologist at Learning Machines, so welcome! NATALIE SMOLENSKI: Thank you so much. SOPHIE BAILEY: We were just having a really fascinating conversations also which I fail to record and now we finally picked up the microphone. I guess what we were talking about is how we prevent recentralization of Blockchain in education, keeping things simple. 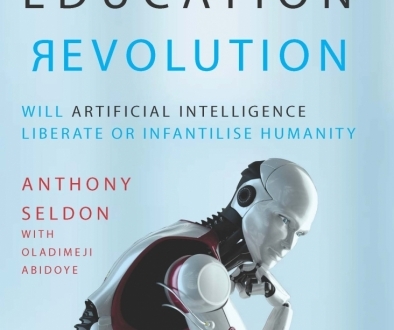 Perhaps where we could start is exactly how you got into this space, got into Learning Machine as well and some of the conversations you’ve been having here at the Global Education Schools Forum. NATALIE SMOLENSKI: Absolutely, so my background is actually as a social scientist. I am very interested in the social impact of technology and Blockchain technology in particular piqued my interest because it represents a new paradigm of governance as we moved into the 21st century. I came to Learning Machine somewhat through an opening that was available and you know I immediately jumped on it. This has been a wonderful role. I feel like I get to build the future, every day, there’s nothing that compares to that. Here at GESF, I’ve had some wonderful conversations with a number of ministries from different countries, all of whom it seems have some awareness of Blockchain technology and it’s something they’ve been exploring, but have been a little murkier about what the actual applications are and so often, coming across Blockcerts it’s like a revelation because they’re like oh, there’s something in the market today that’s actually being used and that is based on an open standards so I don’t have that worry about vendor lock-ins that I might with the proprietary solution that also connects to your earlier question about decentralization. One of the ways that technology gets centralized is when vendors launched proprietary solutions that lock users into their particular ecosystem which is something we certainly didn’t want to happen for Blockchain-based chain records because from our vantage point the whole promise of Blockchain technology is decentralized infrastructure so you’re not beholden to issuing institutions or to software providers to own your data, to verify your data, and to share your data as you see fit. SOPHIE BAILEY: And was there any sort of pattern in terms of some of these ministries that you spoke to which passes the world within from? NATALIE SMOLENSKI: Yeah, that’s a good question. So a couple of them are from Eastern Europe. So I spoke with the Ministers of Bulgaria, someone from the Ministry of Education in the Ukraine and from Turkey as well, so what’s interesting about the adaption of Blockchain technology is that we’re seeing countries that have sometimes been considered to be on the peripheries as actually some of the earliest adopters. So for example the Ukraine has signed the largest deal ever to put all government records on the Blockchain. Georgia has been a pioneer of Blockchain technology. Countries like Malta, the Bahamas, all of them are trying to get in on this because they see real value. SOPHIE BAILEY: From a sort of learners perspective as well, just thinking about your anthropology role, what are the implications? Obviously we can imagine and we’ve spoken previously a bit about implications for universities, etc. What’s the kind of widest social implications in terms of learners and that can be quite a broad term so any one whose going from earliest through the education journey to, you know, someone in their 60s who’s re-skilling or up-scaling, what are the kind of social implications and what do you think the sort of experience will be as we shift from perhaps that traditional pathway to one that can be unable to educations credential on the Blockchain? NATALIE SMOLENSKI: Right, so what we find is we’re still living in a credential based world, so in order to advance in your learning journey, whether it’s moving from kindergarten to middle school or junior high or getting the most advance PhD degree, you need to have some way to reliably document your prior learning. Just today in my conversation with the Deputy Education Minister from Bulgaria, she was saying that within the EU, there’s a big problem that as early as elementary school we have students who are leaving to study in other countries with their parents, and then when they repatriate to their countries of origin often are held back a year or more, and this has the effect of increasing dropout rates and increasing dissatisfaction with the school system and of course they’re being held back because it’s very difficult to established credit equivalencies between these institutions, so what the Blockchain allows for is actually building out kind of infrastructure of translation that allows for the mobility and interoperability of credentials across geographic boarders within different technological systems so that learners can seamlessly move from one context to another without having opportunities foreclosed. SOPHIE BAILEY: So that’s really interesting because one of my big questions was around, I mean I absolutely get the application of having your immutable record of learning on Blockchain, there’s a bigger questions perhaps around the value of these different credential and how we kind of make an equivalent between whenever it’s micro credentials, a degree online, etc. Can you imagine a phase two of Blockcerts which had some way of measuring the value of those different providers? NATALIE SMOLENSKI: That’s a great questions and it’s one we’ve encountered in multiple contexts. There are in the US, for example, a number of nonprofit organizations that deal with basically evaluating the relative quality of education of different institutions. Within the EU there’s a whole qualifications framework that is used to measure institutions and that is attempting to slowly quantify educational value. This we consider as actually a separate initiative from the technology standards that enable verification of the integrity of the document itself. So if you think about standardization efforts, you can divide them into three categories. On the one hand there are technology standards which a kind of the let’s say the rails that get you from point A to point B. In the second type of standard, you have contents standards. So what is it that is moving from point A to point B? What does it mean in context? And that’s a very human decision so this is something Blockchains can’t yet do and I would argue that we might actually be better for that. There’s a third type of standard as well which is a standard of exchange and that is what is particular content worth on the market? So for example, what is my Bachelor’s Degree from Oxford going to be worth? What kind of jobs can I convert that into? How much was it worth to me or to my family to actually attend that institution? So those three standards are they’re actually solving for different questions and what the Blockchain is solving for and the Blockcerts open standards solving for is that first type of standard, the technology standard. SOPHIE BAILEY: Very interesting and how can people follow with how you’re developing or what your particular work is? NATALIE SMOLENSKI: Absolutely. You can find me on twitter, @NSmolenskii. You can also contact us at any time through the Learning Machine website so that’s learningmachine.com. If you’re interested in kind of some thought leadership in this area, please do check out our blog, it’s on medium.com and if you just search for learning machine blog, it’ll come right up. There are lots of articles there that maybe interesting. SOPHIE BAILEY: And final question, we have a book club through the podcast so guest recommendations of books that have impacted the way they think. I wondered if you had any that you know either relate to this, your anthropology perspective or just books that you know you really loved and you got to share with our listeners. NATALIE SMOLENSKI: Absolutely. So I would say there are a couple, one is first of all anything by Paul Vigna and Michael Casey, The Age of Cryptocurrency, in particular, is what first got me thinking about the social impact of Blockchain technology. From an anthropological standpoint, Debt by David Graeber, is a masterpiece, I think, and it has really informed how I’ve been understanding the creation and circulation of value via Blockchain technology. SOPHIE BAILEY: Awesome, well, thank you so much and I hope you have a great next couple of days as well. NATALIE SMOLENSKI: Wonderful! Thank you. That’s all for this week’s episode. Thanks to Natalie and Alex, and go and check out the Blockcerts blog and Alex’s report that I mentioned earlier. 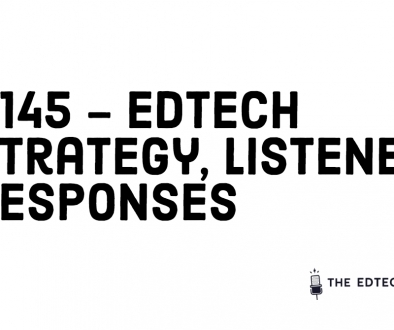 We’re also now placing adverts for our summer episode of the Edtech Podcast so if you’d like to say hello to our listeners, please do get in contact about how to do that. That’s all for us for now, and have a great week.